This is a delicious Romanian eggplant salad that is amazingly simple and even more delicious. You won’t believe the flavor you get from just three ingredients. The key is in the specific but simple preparation. If you thought this post was about what to do with a bunch of leftover moussaka from your last Greek cooking extravaganza, you’re going to be disappointed. If you make moussaka right, there won’t be any leftovers anyway. 😉 If you haven’t made or had moussaka before, you’re in for a real treat. When life hands you squash, make pasta! From the title of this post it sounds like I’m going to go on about how I had a bumper crop of summer squash this year. Actually, I own a small, 4th floor condo with a tiny patio so I don’t even attempt to grow vegetables. I do love all types of squash, summer and winter, and am always looking for new ways to use it. 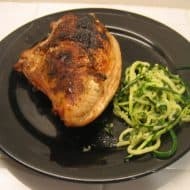 Posted bykai October 5, 2008 February 10, 2019 Posted inLow carb, Vegetarian RecipesTags: pasta, zucchini2 Comments on When life hands you squash, make pasta! Soon after this trip to Hawaii, I decided to make kalua pork at home. I read many recipes, many of which involved some process nearly as complicated as the traditional method. I’ve experimented with various asian peanut sauce recipes. There is some kind of peanut sauce variation in Thai, Vietnamese, Indonesian, Malaysian and other culinary cultures. Most recipes I’ve tried had some less common ingredient I didn’t have or just didn’t taste good. I finally hit on something that tastes great to me and is made with ingredients I almost always have.